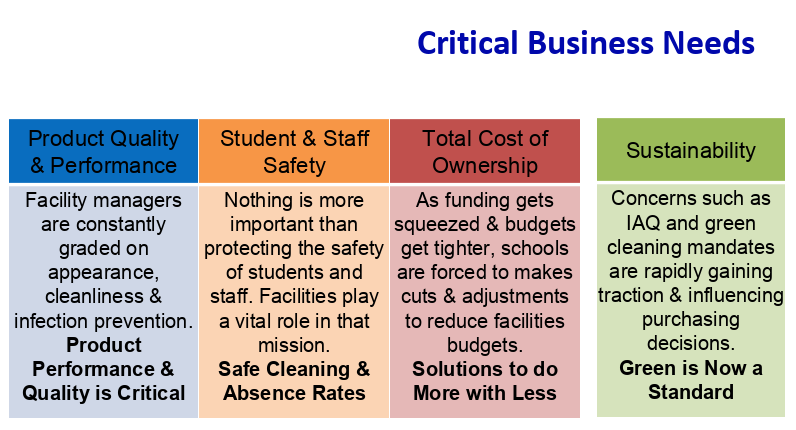 We understand you need more than just a janitor to maintain a safe, healthy learning environment. As an industry leader in education solutions, HG Commercial Cleaning's innovative chemicals, tools and machines seamlessly integrate with our programs to optimize performance and maximize value. For our customers, we are a knowledge-based provider backed by years of experience, as well as equipment, application & industry experts, with tailored solutions that fit your needs. Each day, over 55 million students and 7 million staff attend more than 130,000 public schools and private schools in the United States alone. On average, they each miss about five days per year due to illness, totaling 285 million school days lost. With studies showing that chronically absent students are 7.4 times more likely to drop out of school, and absent teachers costing schools more than $25 billion annually, it's essential to invest in proven, reliable products. That's why HG Commercial Cleaning continues to develop solutions for K-12 and Higher Education that address critical issues in health and hygiene in our schools. All of our owners and managers have school-age children and we treat each school as if our kids go there every day. Facility Services is a competitive business and only the most efficient can thrive. Our integrated portfolio of solutions is designed to use less, waste less and cost less. We look at the entire cost of cleaning from labor to supplies, quality and capital. Every step of the way we help make your operations leaner, greener and more cost-efficient. The risk of pathogens infecting the general public is a severe and ever-present threat. As pathogens are always evolving, it’s not still evident where the risks are and how to mitigate their threat. In educational facilities, preventing disease transmission is an integral part of proper facility management. Typically, fewer infection prevention resources are available and there is less access to infection prevention training and education. Schools are havens for pathogens like Flu, Norovirus and Rhinovirus which can all spread quickly, without warning through a school population leading to illness and high absenteeism. Efficient cleaning and disinfecting practices help eliminate reservoirs of disease which decreases the risk of transmission. Breaking the chain of infection by disinfecting surfaces is essential in preventing outbreaks and providing a safe, secure environment for students, guests and staff.